Abergeldie Castle is a modest 16th century tower house overlooking the River Dee a short distance downstream of the Royal family’s hunting lodge of Balmoral Castle. It consists of a single rectangular tower with a round turret which serves all three floors and the attic, and is not accessible to the public. 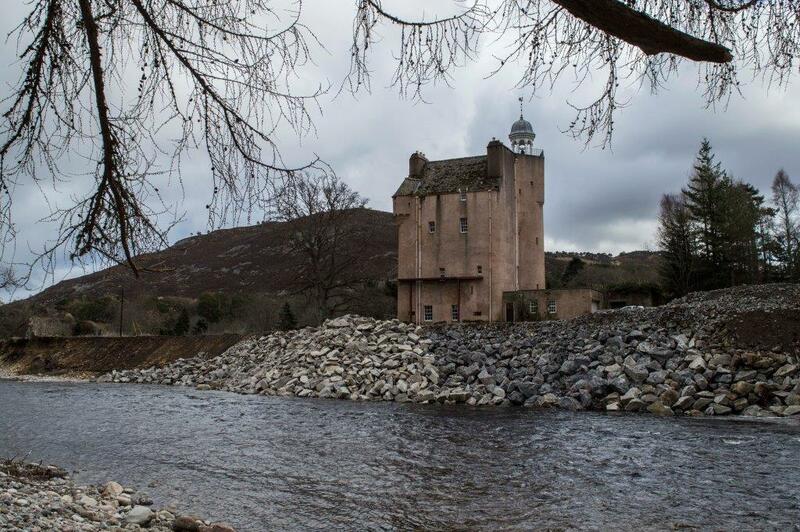 Clear views of the tower can be had from the north bank of the River Dee, which threatened to cause the collapse of the castle when in flood in January 2016. The castle is entered by a ground floor door which leads into a small corridor. Immediately to the right is the winding stair in the round tower (beneath which is a pit-prison), in front is the smaller cellar, and to the right is the larger. the smaller cellar has a second stair leading up to the first floor within the thickness of the wall. The cellars are provided with shot-holes, but not fireplaces. The first floor is taken up by the great hall, although it is possible there was a small entrance porch; this area has been rebuilt. The hall has a fireplace in one gable and small windows. The second floor contains two rooms and a corridor in a matching plan to the basement, but each room is also provided with a garderobe. The third floor plan follows the same layout, but has a round turret in the opposite corner to the stair tower, and a further mural stair leading to the caphouse of the stair tower. The third floor level of the stair tower is corbelled out to create an irregular rectangular profile, and the caphouse is provided with a decorative ogee roof. Further decoration is given to a large third floor window, which is centrally placed, causing the larger bedroom at this level to extend into the corridor area. An 18th century wing was added to the tower to the west, but has been removed. Abergeldie lies in the upland region known as Mar, and remained a property of the various Earls of Mar until it reverted to the Crown in 1435. A dispute between the Crown and the Erskine family dragged on into the 1450s, when eventually the lands of Mar were confirmed as Crown property. Following the loyal support of Alexander Gordon, made 1st Earl of Huntly, in the rebellions of the mid 15th century, the king granted much of upland Mar to the Gordon, and in 1482 Abergeldie was granted to his third son, Alexander of Midmar. Alexander was followed as laird of Abergeldie by his son George by 1504, and then his grandson James by 1523. James Gordon was killed at Pinkie in 1547, and was succeeded by his son, another Alexander. There are no datestones at Abergeldie, but there are said to be strong similarities with another Gordon castle at Balfluig, which is dated to 1556, so it appears likely that the castle was built by James or his son. Alexander, 4th of Abergeldie, appears to have supported his chief no matter what, being bound over to keep the peace in 1562 to the tune of 5000 marks, and later fighting for the Earl of Huntly at the Battle of Glenlivet in 1594, before eventually being succeeded by two of his sons, Alexander and William. William was one of a number of Catholics implicated in a plot against King James VI, and died in 1630, followed by his son Alexander, who was a royalist during the Civil War, and grandson Alexander. In 1689 Abergeldie was occupied by Government troops and besieged by Jacobites, leading General Mackay to raise the siege with an army of some 1400 men. In 1715 Abergeldie Castle was occupied by Government troops, and in the brief 1719 Rising by Spanish troops, but is not mentioned in connection with the ’45. Overall it appears to have survived largely undamaged throughout the troubled 17th and 18th centuries, to be leased by the royal family in the mid 19th century. It should be noted that the old castle of Balmoral was a castle of identical design before it was demolished. Today Abergeldie remains the residence of the Gordon Baron of Abergeldie, and it is believed that despite the undercutting of the riverbank in January 2016, the remedial work carried out as a matter of emergency has saved the castle. Cracks in the harling suggesting that structural damage had occurred could be seen later in the year once the river had subsided, but we can hope these are cosmetic.